I've marked this recipe a while ago and every time I wanted to do it I was missing something. First time there were the carrots. Second time, I was running out of hazelnuts. But for this weekend I had them both available and as I wanted to do an "exotic" bread, this recipe was the perfect one. I have made the preferment the evening before and the next day, I have started to prepare the carrots and the hazelnuts. I am not kidding, the preparation of the carrots took me almost one hour with the whole mess to clean after extracting the juice of the carrots. But I drank the carrot juice and it was so good! To grate 750g of carrots by hand was a lot of work and then to squeeze the juice out of the grated carrots using a gauze ... I had enough ... I swore I'd make myself a present and buy a juice extractor. Or... 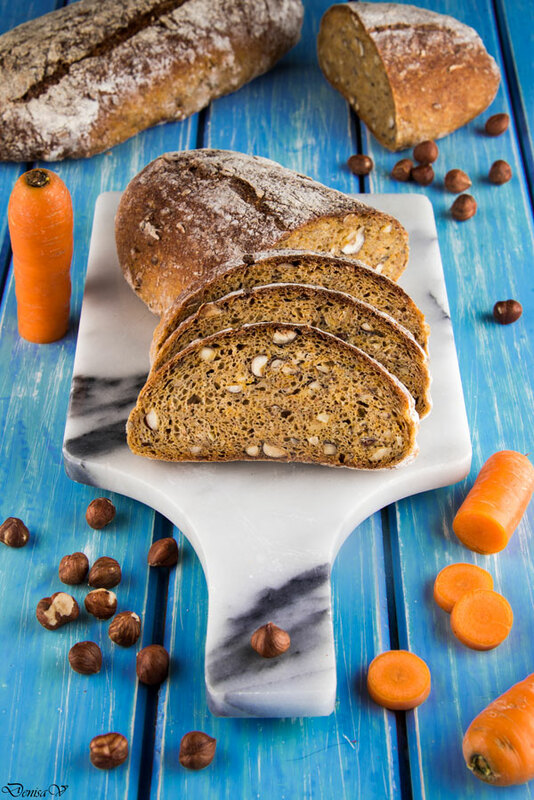 I'll put it on my list for Christmas presents :D. But well, when carrots were squeezed and dried, to make the bread was a piece of cake. Now, regarding the bread, with 12g of yeast in it, the dough raised quickly. The impressive part was that it raised a lot outside but in the oven didn't raise so much. Nevertheless, the resulting bread look was acceptable. Inside, the bread had small bubbles in the crumb, normal for a more tougher dough. The color was obviously almost orange because of the carrots. The taste.... hmm... I might say that hazelnuts flavor was stronger than of the carrots but still, this was a bread not a cake. As a conclusion, it was an interesting bread with an interesting taste and look but, to be honest, I've made more basic breads who caught me more. Make the preferment 12 hours before. Let it sit at 21ºC. Grate the carrots with the finest grater you have. Squeeze the juice using a gauze and drink it. Or use a juicer extractor if you have one. Mix all ingredients except walnuts and carrots for 3 minutes. Add carrots and hazelnuts and continue to mix for 10 minutes on the second speed. Divide and shape the loafs. Final fermentation in floured bannetons for 1h. Bake for 15" at 250ºC with steam then reduce the temperature to 230ºC. This recipe was adapted from Bread: A Baker's Book of Techniques and Recipes - Jeffrey Hamelman, page 198-199.